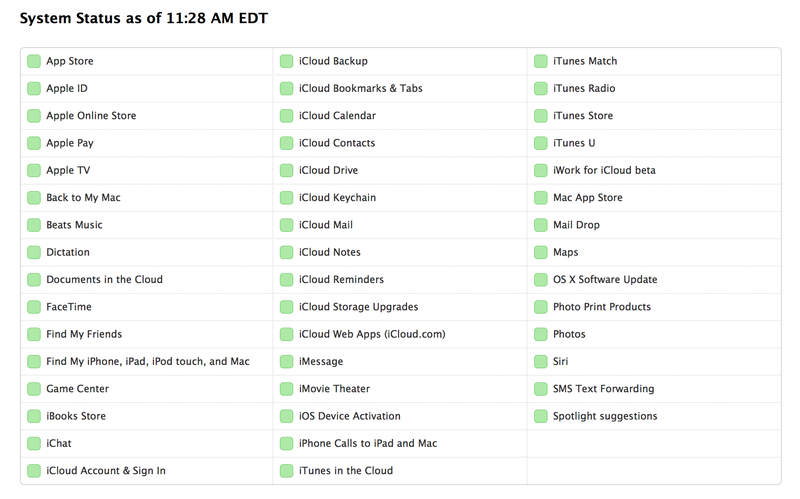 Update 2 9:45PM ET: Users this evening again reported issues centered around iCloud. The outage affected all store services, according to Apple’s status page. It appears to have been resolved, however, with the exception of Game Center. Update: After about an hour of downtime and still with no admission from Apple of anything ever having gone wrong, iCloud services seem to be coming back online now. Despite being listed as fully functional on Apple’s status page, it seems iCloud is once again down for many users. Reports across Twitter and in our own experience here at 9to5Mac have verified that iCloud and the App Store (and possibly other Apple services) are currently down. Aside from bugging out on native devices like Macs and iPhones, the problem is popping up on the iCloud.com web interface (seen above) and even seems to be blocking users’ ability to open the iCloud panel in System Preferences, as doing so causes both the Preferences app and the iCloud Services process to stop responding. As mentioned above, the App Store also seems to be having some issues with installing and updating apps, which is probably related to this downtime. Downloads from the iTunes Store and iBooks also seem to be affected, though all of the stores still load just fine. Photo syncing across platforms is stalling out for some. iMessage appears to be having problems for a number of users, though others are still able to use the messaging service without issue. Find My iPhone is inaccessible for the web and fails to login from the mobile app. iOS activations are also impacted, so iOS users trying to activate new or recently updated devices will be unable to do so. iOS App Store seems to be wicked cranky for me at the moment. Doesn't want to update or install anything. Not all iCloud services seem to be totally down, however. For example, the Notes and Contacts applications still syncs across devices. iCloud mail can’t receive incoming mail, but is able to send messages for some users. Podcast downloads, while technically part of iTunes, are up as well. Some reports of Find My Friends breaking are also rolling in, but in our testing that still seems to be running. Developers are also finding that the CloudKit Dashboard is unresponsive.